Here at Seer, we are no strangers to working with people around the country. Many of our clients aren’t based in Philly or San Diego, and as we grow our team, many of our employees aren’t either. We realized that sometimes, the best folks we could work with aren’t in Philly or San Diego, so back in the fall of 2017, we began hiring remote positions. Working with and managing a remote team that is not in the same physical location can be demanding. Sometimes communication is skewed, deadlines can slip through the cracks, and the general workflow can be tough (nobody wants to have a meeting at 7 am!). To help strengthen our empathy and make sure we provide clients with the best work possible, we have a few tips for others out there in similar positions. How often do you communicate with the other folks on your immediate team? Through what mediums do you most communicate? At Seer, our teams typically consist of seven Account Managers/Associates and one Team Lead. So if you’re managing a team or reporting to a direct manager, only 7% of what you communicate are the words that you say, 38% is your pitch/tone of voice, and the remaining 55% is your body language! It would be a disservice to subordinates and managers alike to limit communication to only 7% (written) or 45% (verbal). So much can be lost without “face-to-face” interaction. Even with many of our clients, we default to weekly video meetings. We’ve found that having the ability to pick up on the words, tone/pitch in voice, and body language of the folks we’re talking to even when we’re not in the same room together is tremendously helpful when it comes to building client relationships, understanding the meaning behind spoken words, and interpreting feelings and emotions. The same can be said of the internal team environment. Unfortunately, video meetings can get a bit wonky from time to time, and it can be hard to remain consistent with them when facing technical challenges. There are lots of options out there – Google Meet, Zoom, and Skype to name a few. Our recent default has been Zoom – we’ve found that the picture and audio quality tends to be the best and most reliable. Our advice is to always have a tech backup – either another video meeting platform or a conference line, just in case. Aligning on workflow and schedules can be difficult with team members that you don’t see every day, but when it comes to coordinating with colleagues who are in different locations, these logistics are essential to a productive team. How many times have you told your manager that you’ll have that deliverable to them by the end of the day? When you’re in the same time zone, 5:00 pm means 5:00 pm. But to remote team members, this could mean anything from 2:00 pm to 8:00 pm. At Seer, we have flexible working hours, which means our team members arrive and leave the office at different times each day. Learn more about what it’s like working at Seer — watch the video below! Keeping track of the schedule of the person who sits next to you can be a struggle, but for remote team members you don’t see everyday — it’s just about IMPOSSIBLE. Sometimes schedules get overloaded – someone forgets to update a project status or a deliverable needs to be wrapped up last minute. We get it. People aren’t perfect and things can fall through the cracks. Ask any Seer team member and they’ll be able to tell you about the time they had to jump back into work late at night to clarify a miscommunication or wait for an answer from their teammate until the next day. We’ve found that the best way to overcome these challenges is to define your ideal workflow with each team member. It sounds like an overwhelming task, but like anything, practice makes perfect. Decide on a case-by-case basis when the best time for your team members to complete or review work is, and respect their working hours – nobody wants to join a meeting at 7 am PST! Think about the number of times per day that you stop someone in the hallway to chat about a project. Maybe you spark an impromptu brainstorm session and end up with some stellar ideas that you plan to execute. Great! Now think about your remote team members that don’t have the same kind of interactions in their day-to-day work … not so great. Maybe in this same brainstorming session, there were critical tasks that were discussed and involve your remote team member. Without the necessary details, it’s impossible for your team to understand the full context of an assignment, and therefore, impossible for them to do their best work. By taking detailed notes at all meetings – both major and minor – you set up the whole team for success and optimal workflow. We’ll admit: sometimes taking extensive notes during all meetings is tough. You get rolling on a topic and it takes away from the conversation to stop for notes. So how do we work around this? Meeting recaps have always been helpful for our clients, where we detail what was discussed and action items coming out of all calls. By completing a similar recap after internal meetings, it allows our internal team members to ensure alignment in each area of a project. More often than not, we find that even shorthand notes or a quick five-minute video chat to catch up your remote team members can be the difference between success and failure for a project. Have you ever found yourself working somewhere other than your normal office and trying to call into a meeting where everyone else is in the same room? It can be technically challenging, but even more frustrating, it can be challenging to feel like you aren’t a real part of the conversation. So often, meaningful conversation continues after the meeting “technically wraps” and the phone is hung up. If you aren’t physically present, then you are missing out on the conversations that happen before or after meetings, in the elevator, in the kitchen, or back at your desk. 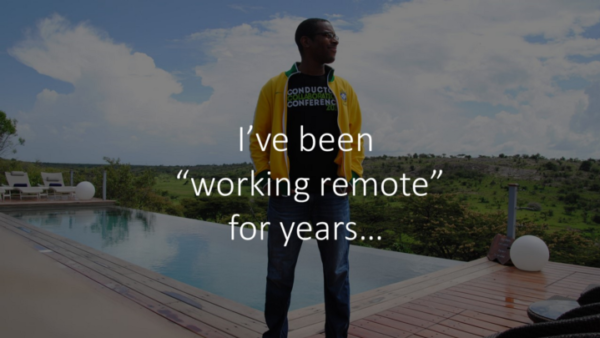 You don’t really know how it feels to be remote until you’ve worked remotely. If you are managing, being managed by, or working with anyone remotely, we strongly recommend having your entire team take some meetings remotely. But that’s silly, right? You didn’t commute to the office just to take a call from your desk. We are generally huge proponents of in-person meetings. Having the face-to-face time is beneficial. But when you are working with someone who is remote, they are missing out on the beneficial face-to-face time that everyone else is enjoying. That distance can be detrimental to the remote team member’s performance, and feeling like they are part of the team. Seer’s leadership team has challenged itself to spend 20% of its time working remote. That breaks out to one day each week working somewhere other than our offices. Why do this? It comes down to one word: empathy. Understanding what it feels like to work remotely, and the challenges that remote work brings helps you be more empathetic to remote workers on your team. You will never forget to include a dial-in or video conference link in a meeting invite again. You will learn how to troubleshoot technical bugs in conferencing systems so you can help others on the fly. You will hold more impactful meetings, where the meat of the discussion is taking place in the meeting, not in the office kitchen. Taking meetings remotely is challenging and inefficient … but that is the point. By making yourself remote, you will be better equipped to support remote members of your team. Now that you’ve got the technology and process set up, you’re almost good to go. But working remotely is about more than just efficiency and productivity – it’s about relationships. When we work in the same location with a team member, we get to know them on a personal basis. But when we’re on opposite coasts, we miss out on a lot of those interactions, whether planned (happy hours, team-building events) or impromptu (water cooler chats, desk buddy bonding). Without a common physical location, we’re missing out on those in-person encounters that connect people and often inspire great ideas. Here at Seer, we have a questionnaire that we fill out when working with someone for the first time. It helps us get to know one another and gives us a strong understanding of each others’ working style, goals, and habits. When we’re in the same office, we’ll discuss our answers over coffee, but there’s no reason that we can’t do that virtually. Make it a point to schedule virtual social chats on a regular basis, which allow you to check in and leverage each other in your personal and professional growth. But don’t let it end with just one getting-to-know-you chat. We believe that people to people connections take precedence over business to business or business to consumer frameworks. In fact, we do all that we can to make sure that the digital journey is more than just marketing – it’s personal. Above all, keep making those personal connections with your team members and your clients. At the end of the day, we’re all human. Have any other tips that you use to stay connected to your team abroad? Let us know in the comments! Do you want an opportunity to work remote? We’re hiring!